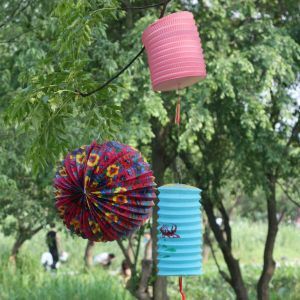 Coloured hanging lanterns against teal firs: Every objects holds a memory. And I really feel your absence. I know the door is locked. It’s a green blur from here and a kitchen table through a window. Pale wood, solid. Definitely circle. I try to recall your face. I try to summon memories time locked away. All I get is fish and chips and an aubergine cardigan. The sun is setting, falling behind the firs.